Mahalo to Shane for choosing Maggie Joe Sport Fishing! He spent the day aboard the Sea Hawk with Captain Darryl on a sport fishing charter. The fishing was fast and furious as they were able to bring home 9 Mahi Mahi and 2 Short Billed Spearfish while deep sea fishing off Honolulu, Oahu! Aloha! Brad with his Mahi Mahi! 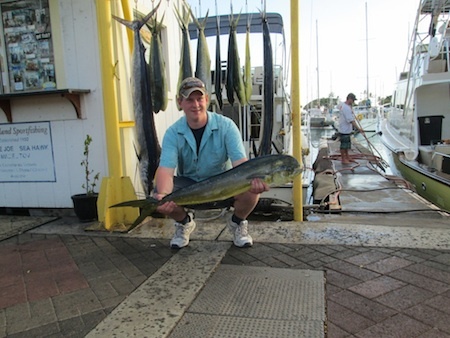 Mahalo to Brad for choosing Maggie Joe Sport Fishing! Brad joined Captain Matt aboard the Ruckus on a sport fishing charter. He brought home this nice Mahi Mahi after a day of deep sea fishing off Waikiki, Oahu! Blake, Kenny, Mason, Chase, Rhyse and Brayden with their catch! 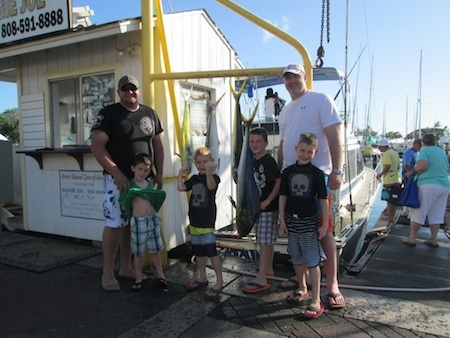 Mahalo to Blake, Kenny, Mason, Chase, Rhyse and Brayden for choosing Maggie Joe Sport Fishing! 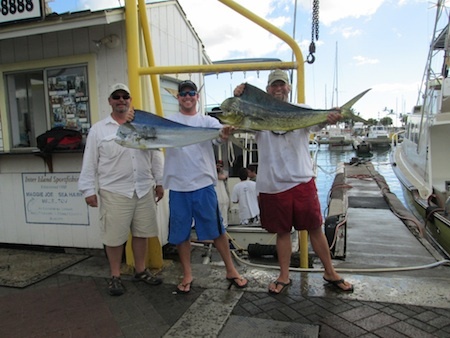 The guys joined Captain Mark aboard the Maggie Joe on a sport fishing charter. The guys brought home 4 Mahi Mahi while deep sea fishing off Waikiki, Oahu! Hana Hou! 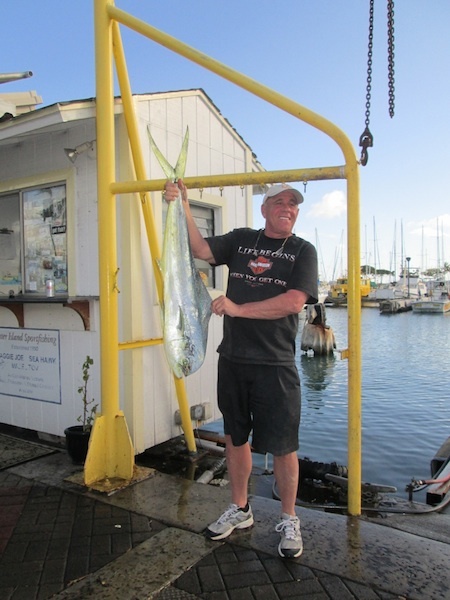 Mahalo to Greg for choosing Maggie Joe Sport Fishing! 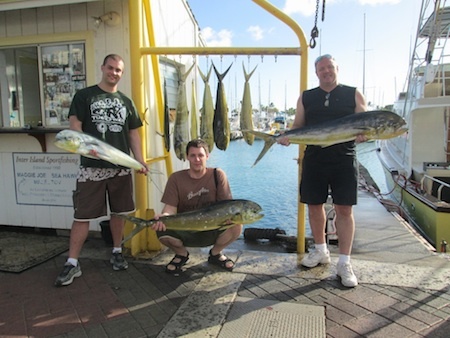 He joined Captain Mark and Mate Billy on a sport fishing charter aboard the Maggie Joe. He hauled in a pair of nice Mahi Mahi while deep sea fishing outside of Honolulu, Oahu! Aloha! Meagan and Daniel with 2 Mahi Mahi! 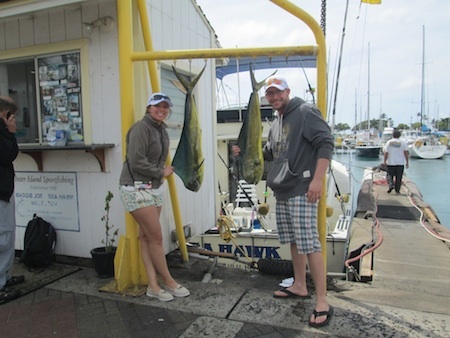 Mahalo to Meagan and Daniel for choosing Maggie Joe Sport Fishing! 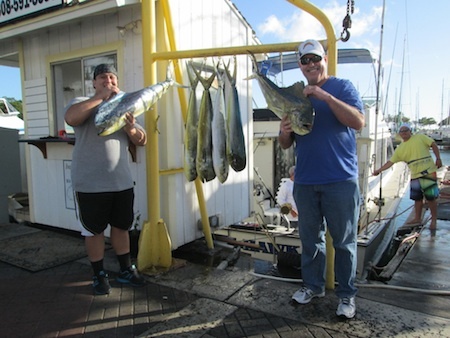 The pair joined Captain Darryl aboard the Sea Hawk on a half day sport fishing charter. 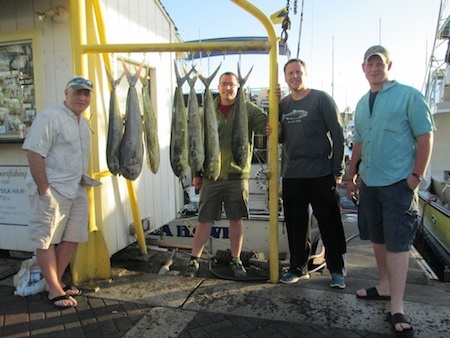 They hauled in a pair of tasty Mahi Mahi while deep sea fishing off Honolulu, Hawaii! Hana Hou! Greg, Tyler, Pat, Matthew and Viola with their catch! 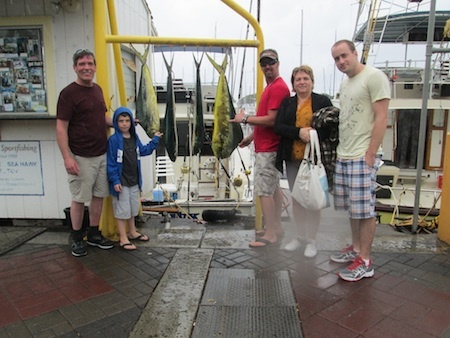 Mahalo to Greg, Tyler, Pat, Matthew and Viola for choosing Maggie Joe Sport Fishing! The group joined Captain Matt aboard the Ruckus on a half day afternoon fishing charter. The fishing was good throughout the day and they were able to bring home 4 Mahi Mahi after deep sea fishing outside of Waikiki, Oahu. Aloha!